Under the Trump administration, the composition of the U.S. Circuit Court of Appeals and the U.S. District Courts is transforming rapidly. This page shares resources about this dramatic change. Immediately upon assuming office, President Trump began nominating individuals for judicial vacancies who would, in the words of his advisor Leonard Leo, make the courts “unrecognizable.” He started by filling the stolen Supreme Court seat which was held open by Senate Republicans after they refused to consider President Obama’s nominee, Chief Judge Merrick Garland. President Trump quickly nominated and the Senate confirmed Justice Neil Gorsuch. But the impact the President has had on the courts extends far beyond the Supreme Court. Indeed, Senate Republicans held open more than 100 lower court vacancies that the President is now filling. Since 2017, the Senate Majority has confirmed 69 nominees to lifetime appointments, 26 of them to the U.S. Circuit Courts of Appeals. In order to reach such break-neck speed, the White House and Senate have broken the very process used to identify and confirm well-qualified nominees to serve in these important positions. 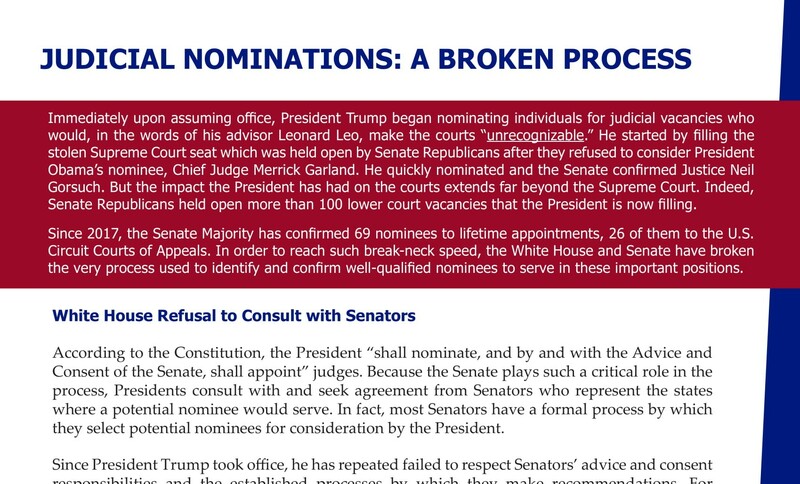 This fact sheet explains how the White House and the Senate are disregarding usual standards and norms for confirming nominees. The Trump administration is moving to nominate individuals for vacancies in the U.S. Circuit Courts of Appeals and the Senate is rapidly confirming those nominees. 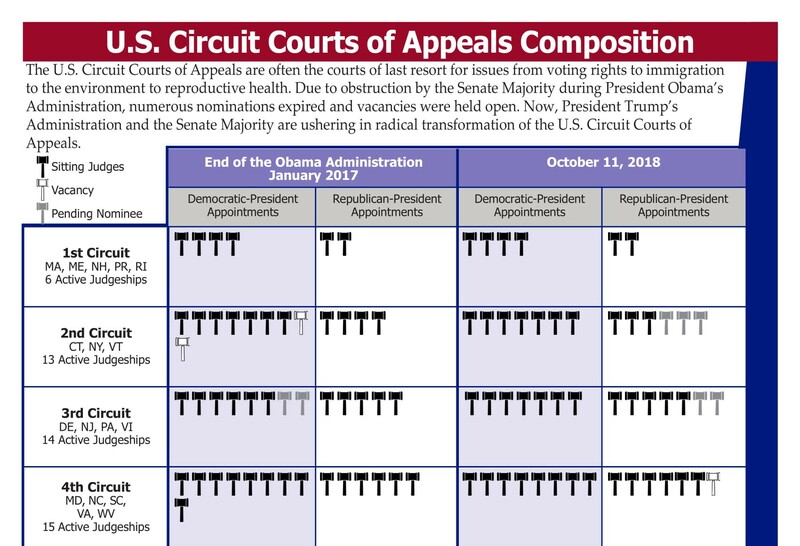 This frequently updated infographic illustrates the changing composition of circuit courts. Every day, federal courts decide cases critical to our rights — from the environment to voting to immigration. Those who are appointed to serve on the bench must be qualified, fair, and impartial. Most people know that Supreme Court Justices serve for life, and so do federal District and Circuit Court judges all over the country. This two-pager explains how nominees are identified, announced, and processed by the Senate. To reinforce the constitutional requirement that the President seek the advice of the Senate, the blue slip was created more than 100 years ago. It is a physical blue piece of paper that Senators receive from and return to the Senate Judiciary Committee Chair to indicate if they support or oppose nominees to the federal courts in their state. This fact sheet explains the Senate custom that enables home-state senators to show proof of their advice and consent responsibility. The Senate Judiciary Committee is responsible for the initial stages of the confirmation process of all nominations for the federal judiciary. 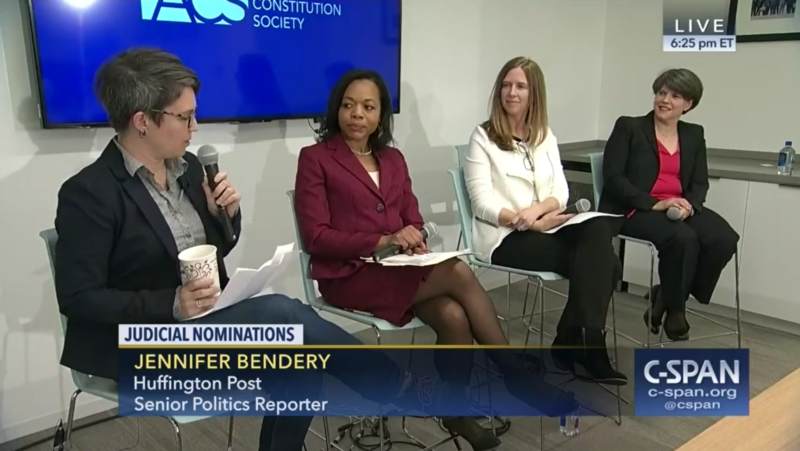 In January of 2018, ACS held a discussion on the judicial nominations process under the Trump administration with Lambda Legal, the Lawyers' Committee for Civil Rights, and the Leadership Conference on Civil and Human Rights.